This classic print by Robert Taylor is available on the Secondary Market and we have one available in very good condition. Marine Ace Captain Joe Foss leads a flight of eight F4F Wildcats of VMF121, based at Henderson Field, Guadalcanal, in a diversionary attack on the Imperial Japanese battlecruiser Hiei north of Savo Island, Friday November 13, 1942. In the distance TBF Avenger torpedo bombers of VMSB-131, having already attacked from the starboard side, head for base. That evening, after relentless air attack, the Hiei, disappeared beneath the sea- the first Japanese battleship sunk by American Forces in World War II. 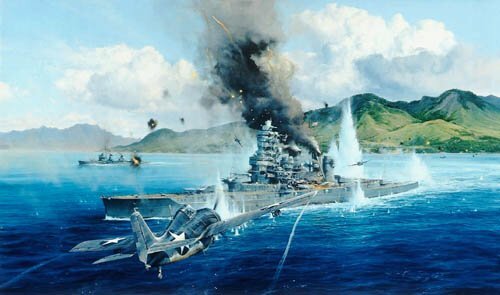 Prints in this signed and numbered limited edition are signed by Marine Ace and Medal of Honor recipient Joe Foss and three of his surviving pilots. In addition, 50 Millennium Proofs are issued with matching numbered companion print 'Corsair Recovery' signed by Royal Navy Fleet Air Arm Aces from the Pacific Theater.